As regular readers know I've spent a lot of time over the last few years investigating Christus Victor theology. The classic modern account of Christus Victor is Gustaf Aulen's book. So the main theme in Christus Victor is Christ's battle with dark cosmic forces, forces that afflict and enslave humanity. 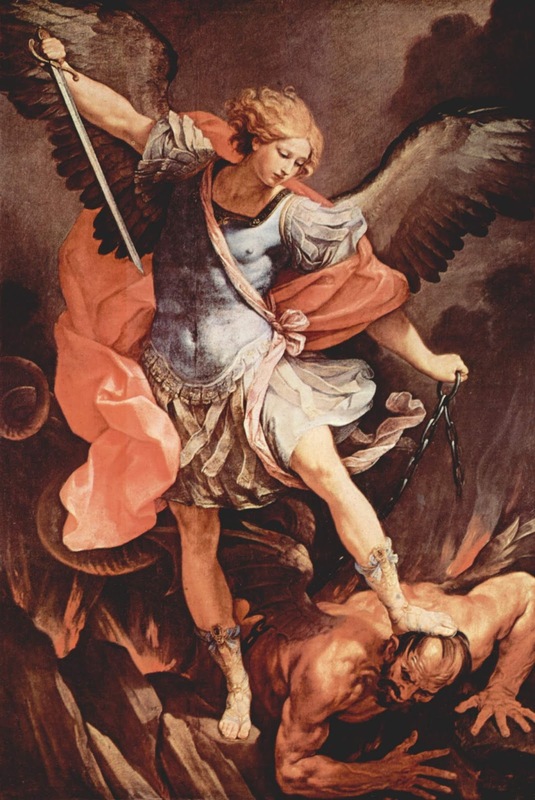 And when you read about that battle in the Bible you're going to read about St. Michael the archangel. Only two angels are named in the Bible, Gabriel and Michael. There is a third, Raphael, if you include the Apocrypha. Of these, Michael is the angel that is portrayed in the Bible as leading God's armies against demonic forces. Then he continued, “Do not be afraid, Daniel. Since the first day that you set your mind to gain understanding and to humble yourself before your God, your words were heard, and I have come in response to them. But the prince of the Persian kingdom resisted me twenty-one days. Then Michael, one of the chief princes, came to help me, because I was detained there with the king of Persia. So here in the Old Testament we find Michael associated with angelic combat, a particularly powerful "chief prince" among the angelic armies. Because of texts like these in the Catholic and Orthodox traditions prayers to St. Michael evoke Christus Victor themes, petitions for protection from dark spiritual forces. Prayers to St. Michael are also used in exorcisms. Theologically, as the leader of God's army Michael is considered to be the enemy of Satan and a symbol of the victory of good over evil.